The BM15A is a revolutionary nearfield monitor offering exceptionally high performance. Its full range extended bass response makes it the perfect nearfield monitor, particularly for commercial studios, project studios and post production facilities. The BM15A is a relatively large 2-way active system comprising of a large 240mm (10") woofer, a special version of the Dynaudio ESOTEC soft dome tweeter and an electronic phase-aligned crossover, which feeds the build-in dual, high performance discrete MOSFET amplifiers. The BM15A is a revolutionary nearfield monitor offering exceptionally high performance. Its full range extended bass response makes it the perfect nearfield monitor, particularly for commercial studios, project studios and post production facilities. The BM15A is a relatively large 2-way active system comprising of a large 240mm (10") woofer, a special version of the Dynaudio ESOTEC soft dome tweeter and an electronic phase-aligned crossover, which feeds the build-in dual, high performance discrete MOSFET amplifiers. The ESOTEC HF driver spells quality and headroom due to a dynamic headroom of 1000W, and the 240mm (10") bass driver is world-renowned for its 100mm (4") aluminium alloy voice coil, which outperforms most 300mm (12") drivers in terms of power output and sheer punch. The electronics offer complex protection circuitry helping to prevent accidental damage to the drivers, while still providing maximum transient response. 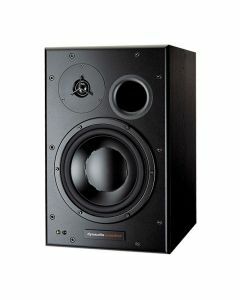 The BM15A monitor is front ported for powerful and extended low frequency response, and the elegant matte cabinet has radius edges on the front baffle to reduce boundary effects and improve the overall sound quality.